For most data object types, Visual MODFLOW Flex allows you apply various arithmetic operations to your source data. Operation settings can be accessed by clicking on the Operations tree node in the Settings window. (To access the Settings window, in the Data Explorer, right-click on the data object and select Settings... from the pop-up menu). Each type of operation is described in detail in the following sections. Arithmetic operations allow you to shift the elevation values in the data object source data according to a user specified arithmetic expression. For example, you can use this option to drape a map over a specified surface data object. You can also shift polylines, polygons, points or surfaces up or down by a specified constant value. Arithmetic operations can be applied to polygons, polylines, points, surfaces and maps. •Select the desired arithmetic expression from the Select Operation combo box. •If you are unsure of what the expression does, refer to the provided description in the Description and Instructions text box. •The contents of the Input Parameters frame will vary depending on the selected expression. •If the selected expression contains a constant value, e.g., Z = Constant, enter a value in Value field. •If the selected expression requires a surface, e.g., Z = Surface(x,y), then select the desired surface from the Data Explorer, and then click the button to insert the surface into the Value field. 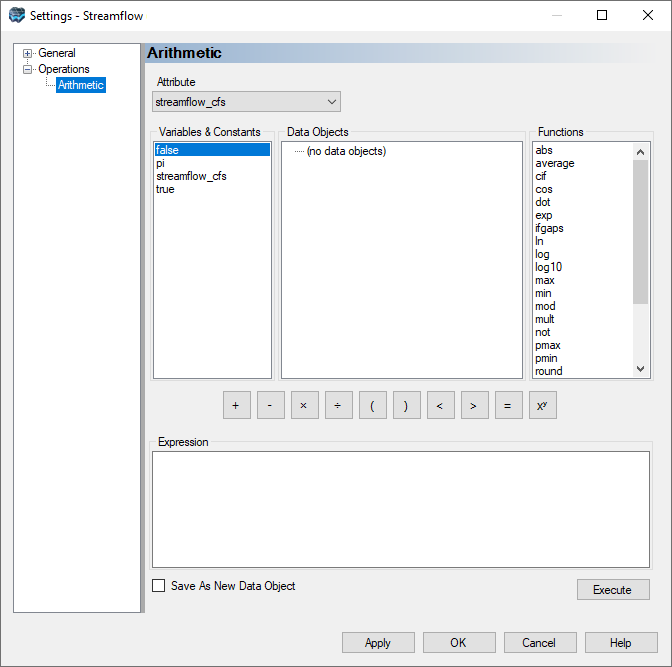 •Optional: Select the Save As New Data Object check box to save the transformed data as a new data object. •Click the [Execute] button to apply the operation. Please Note: If the data object is being viewed in a 3D Viewer while the operation is applied, you may have to turn off the data object, and then turn it back on to see the changes. For time-schedule data objects, Visual MODFLOW Flex allows you to modify attribute values using a specified constant value. For example, the constant value can be set equal to, added to, subtracted from, and multiplied by the existing attribute values. •Select the desired expression from the Select Operation combo box. •In the Input Parameters frame, select an attribute from the combo box under the Value column. •Enter a value in the Constant field, under the Value column. This operation allows you to create a new attribute using 3D Gridded data for surface and points data objects. This feature can be useful after you have run the numerical model simulation using Visual MODFLOW Flex, and you have imported the .HDS file back into Visual MODFLOW Flex as a 3D Gridded data object for visualizing the heads in 3D Viewer. The head information in the 3D Gridded data object can be extracted, and interpolated for a surface or points data object. You can then use the Color by Attribute feature to display the heads information on the surface or points data object. Likewise, this can be used for visualizing any attribute contained in a 3D Gridded data object on a surface or points data object. This procedure is described below. This operation can be accessed from the Settings dialog. 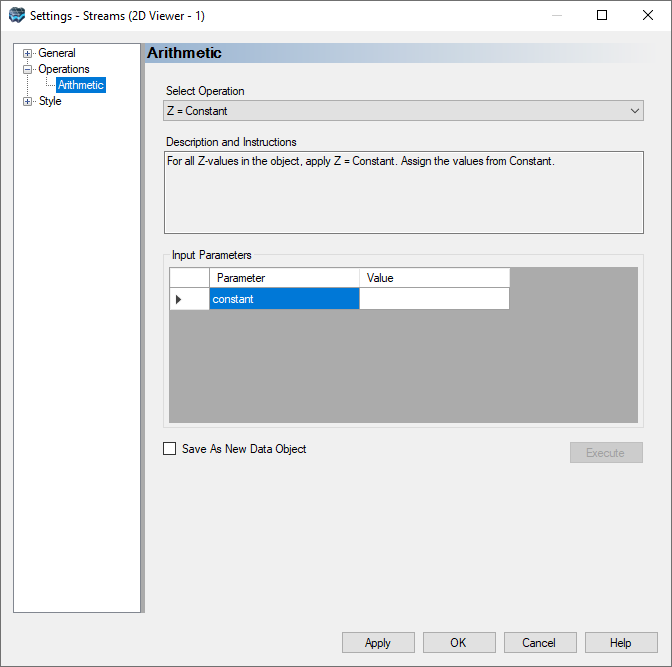 Select the surface or points data object in the Data Explorer, right-click and then select Settings... . Once the Settings dialog launches, expand the Operations node, and select Attribute from the settings tree. •Select Create new Attribute from the Select Operation combo box. •Select the 3D Gridded data object from the Data Explorer, and select the button to insert the data object into the dataObject field. •Once the 3D Gridded data object is selected, its available attributes are populated in the Attribute combo box. Select the desired attribute from the Combo box. Once the operation is applied, you can confirm that the new attribute was created by viewing the table view for the selected surface or points data object. This operation allows you to create a new points data object, for each model layer interpretation, from all cross sections in the data object that include this interpretation. Once the points data objects are created, you can then create surface data objects, which can then be used to define the horizons of your conceptual model. Please Note: This feature is available for model layer interpretations only. •From the Select Operation combo box, select Convert Model Interpretations to Points Data Object (default). •Once the points data objects are created, they will be added to the Data Explorer, where they can be used to create surface layers. 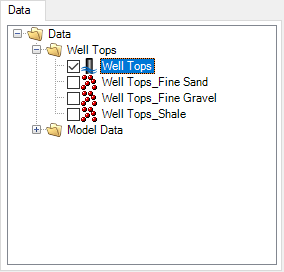 This operation allows you to create a new points data object, for each well top formation in a wells data object. The resulting points data objects can then be used to create surfaces, which can be used to define the horizons of a conceptual model. Well top data can either be included during data import, or they can be manually defined in the well table view. For information on defining well tops, please see "Adding Well Tops" section. To access this operation, right-click on the desired wells data object in the Data Explorer, and select Settings... from the pop-up menu. In the Settings dialog, select the Operations node, and a window, similar to the one shown below, will display. •Select the Convert well tops to points data objects option from the Select Option combo box (selected by default). Once the points data objects are created, they are added to the Data Explorer using the naming convention [wells data object name]_[formation label] (shown above). This operation is only available for well data objects. It allows you to calculate elevation values for each well head in the data object, using a specified surface data object. Please note, any well head elevations that have been added manually or imported will be overwritten with the elevation values calculated from the specified surface. •Select Calculate well head elevation (Z) from a surface from the Select Operation combo box. •Select the desired Surface data object from the Data Explorer, and select the button to insert the data object into the surface field. Once the operation is applied, you can confirm that the new Z values were created by viewing the table view for the selected well data object. Please note that Visual MODFLOW Flex will ignore wells where the elevation of the bottom of the well (Zmin) is greater than the calculated well head elevation.